As one of the most promising nanostructures, core-/shell-structured nanofiber has been widely used in many applications such as self-healing, drug and gene delivery, and tissue engineering. Hollow or core-/shell-structured nanofibers have generally been produced using single-needle and/or coaxial electrospinning methods. This method involves occurrence of varying sizes of bead formation. 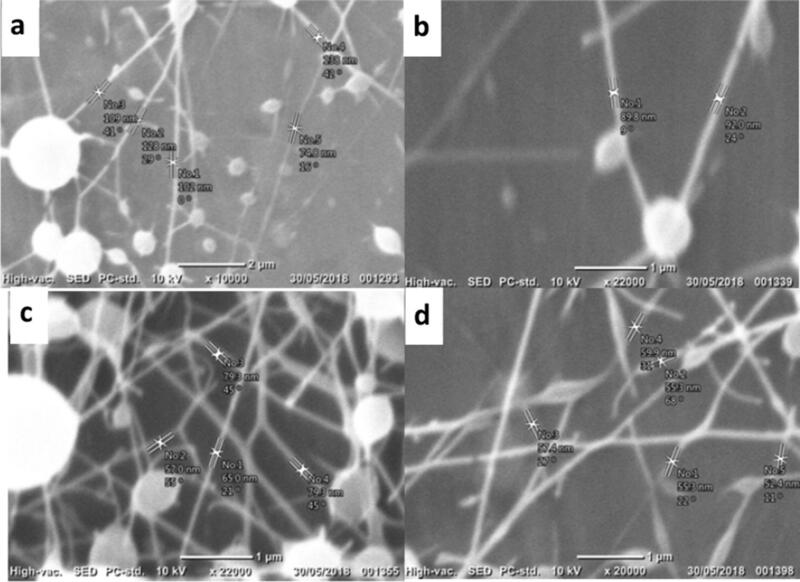 In this study, a single-needle electrospinning technique is applied for investigating the processing parameters affecting the fiber morphology and the bead formation in order to understand this innovative technique for further studies. Results showed that the parameters such as the voltage difference, collector distance and solution concentration have significant effects on the shell fiber morphology and the occurrence of bead formation. The electrospinning has been attracting considerable attention as an effective method for developing multifunctional micro- and nanofibrous materials from various polymers and composites [1, 2, 3, 4]. 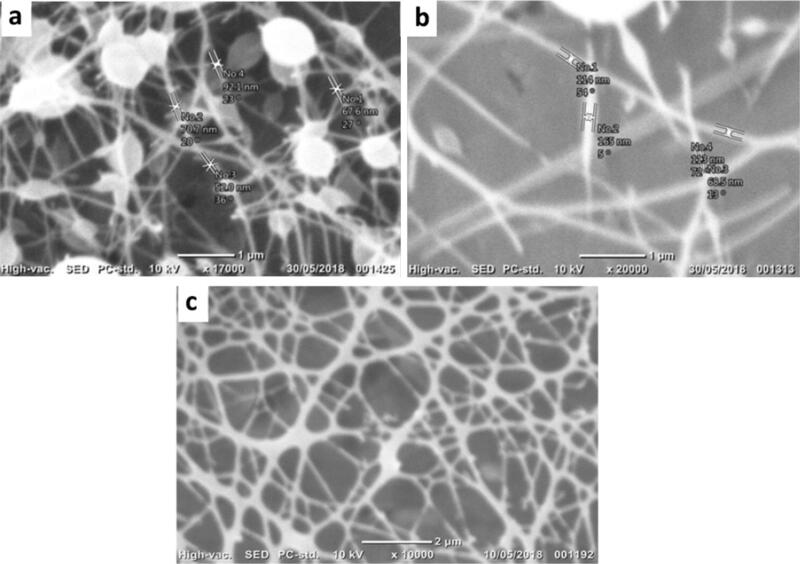 Micro- and nanofibers produced using the electrospinning technique have many extraordinary properties such as high surface-to-volume ratio, high porosity, extremely small diameters along with interconnected micro-/nanostructure and surface functionality. Recently, they have been widely utilized and used in a variety of applications such as biomedical [5, 6], tissue engineering , drug delivery [1, 8], wound healing, sensors, smart textiles, composite reinforcements , filtration  and self-healing . One of the most demanding areas for nanofibers is in biomedical studies. Nanofibers are proved to be the perfect candidates for drug delivery and tissue applications . For example, nanofiber mats can be used for providing a platform for tissue cells; therefore, tissue cells can multiply and differentiate for the tissue that they meant to form . Kalantari et al. explained how chitosan nanofibers are used for tissue scaffolds, wound dressings and antibacterial coatings. Moreover, Ghosal et al. reviewed the utilization of polymer–titanium dioxide nanocomposites for tissue engineering and wound dressing and discussed the significance of the electrospinning technique in these applications. Recently, functional composite nanofibers have been loaded with β-TCP and SIM, which are manufactured by electrospinning method are studied for drug delivery system by Rezk et al. In all these applications and many others [2, 4, 14, 15, 16], electrospinning is adopted due to ease of production and straightforward setup. The electrospinning method can be regarded as a very flexible, simple and versatile technique that has varieties as follows: single-needle electrospinning, coaxial electrospinning, modified coaxial electrospinning, blend electrospinning and side-by-side electrospinning . Among these, “the coaxial electrospinning” is the technique to produce such structures in which two or more dissimilar solutions injected independently from two different coaxial capillary channels. Coaxially spun hollow and core-/shell-structured nanofibers have been attracting considerable attention in recent years [17, 18, 19, 20] and shown to be very promising in self-healing, drug and gene delivery and tissue engineering [12, 13, 14, 15, 16, 17, 21]. 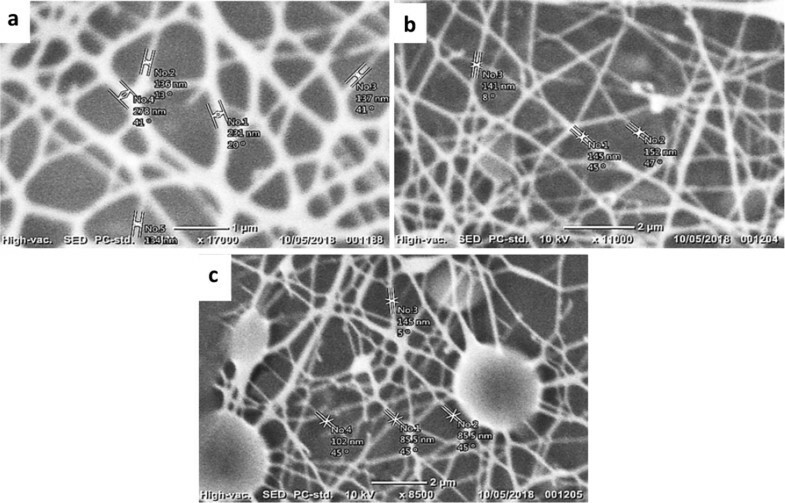 Mainly, core-/shell-structured nanofibers which could also be considered as composite nanofibers constitute two parts, namely the inner “core” and the outer “shell” layer [17, 22]. Both layers can be utilized for different purposes and functions with differing compositions. 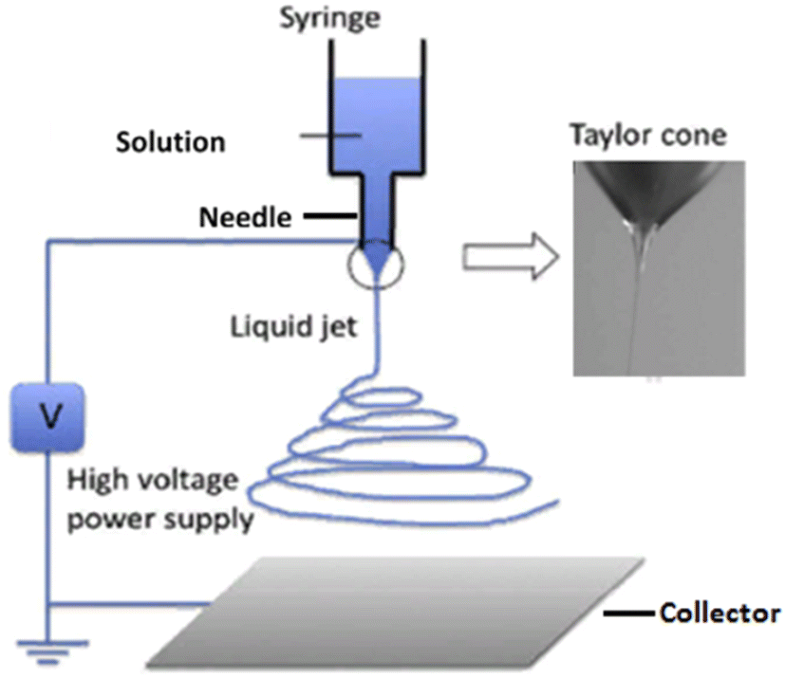 In this technique, the voltage difference between needle and collector is used to create an electrical area that affects the droplet formation at the tip of the needle and draws nanofibers from the tip to the collector . The most promising approach for producing core-/shell-structured fibers involves the use of coaxial needles. In this regard, it is possible to combine a variety of compositions to create original and innovative applications in so many different fields . As an interesting example in this respect, bovine serum albumin (BSA)-containing dextran is embedded in polycaprolactone (PCL) nanofibers for drug delivery applications . For the purpose of drug or gene carrier, polyelectrolyte complexes (PECs) are produced by mixing two polymers with opposing charges that form a two-component complex on a molecular level . Self-healing is a significant field in smart and autonomous materials attracting considerable attention both commercially and scientifically [9, 11]. One example of the self-healing technique is where the micro-/nanoencapsulated healing agent is released upon cracking into the epoxy matrix and reacts with the catalysts to repair the damaged sites . In a recent study, it is shown that self-healing of scratch and/or cracks can be healed using polystyrene (PS) fibers with core shell structure fabricated by coaxial electrospinning technique. In this, epoxy or curing agent as healant loaded as the core and PS as the shell are shown to an effective self-healing system which heals a scratch on a coating surface . Bead formation occurs in the electrospinning of nanofibers, and they may function as nanopockets acting as reservoirs for the healing agents. In this regard, liquid healing agents encapsulated in beads may have a critical role in self-healing mechanism. There are certain processing factors affecting the formation and manipulation of the size of beads [11, 25]. Due to the significance of this technique, it is obvious that conducting a study on the processing of the electrospinning will shed light and develop a better understanding of the formation of beads. In this work, a single-needle electrospinning technique is studied and the processing parameters affecting the fiber morphology and bead formation such as solution concentration, voltage difference and collector distance are investigated in order to understand the technique for further studies. Hollow nano- and near-nanosized fibers were manufactured and examined using SEM–scanning electron microscope–techniques. Processing parameters were studied along with the morphological features of the hollow fibers and beads. Consequently, developing insight into processing parameters effects via electrospinning method requires too many solution pairs in the experiment. 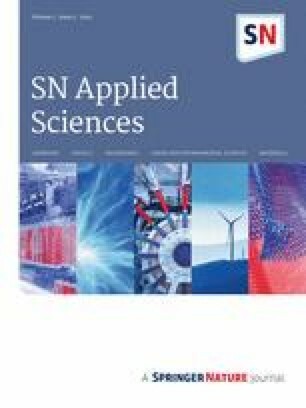 In this regard, the results of the single-needle/nozzle experiments can be extrapolated for forecasting the results in coaxial applications considering the solution pair’s features by researchers conducting these experiments. Polyvinyl alcohol (PVA) is selected as the electrospinning polymer owing to its cheaper price and the availability of its solvent which is distilled water. Polyvinyl alcohol (PVA, Mw = 85,000–124,000) is purchased from Sigma-Aldrich and used without further purification. PVA is dissolved using distilled water in an Erlenmeyer flask and stirred with a magnetic stirrer at 40–45 °C for 2.5 h. Then the solution is filtered via filter paper to avoid the formation of dust and unwanted particles which may affect the fiber morphology. 10, 12 and 15 wt% PVA solution concentrations were used in electrospinning trials. The method is widely used by other researchers and refers to early 1900s Formhals’ patents [26, 27]. Modern electrospinning setups consist of pumps, syringes, high-voltage power supply, needle, camera and collector as shown in Fig. 1. The metal needle is connected to the positive pole of the power supply, and the collector is connected to the negative one. The high voltage difference between needle and collector creates an electrically charged solution at the tip of the needle. The charged solution forms a phenomenon called “Taylor cone” and polymer jets start to be drawn out from the tip of the needle to the collector, while the pump feeds the needle tip with the solution through the syringe. Solvents are vaporized during flight; thus, jet solidifies before reaching to the collector. There are several parameters that affect the morphology of the fibers. The size of the voltage difference affects the diameter and dispersion of the fibers on the collector. A collector may be a rotating disk, rotating drum or a simple aluminum plate as in this work. Parameters affecting the electrospinning technique can be listed as follows: ambient parameters, solution parameters and application parameters. Ambient parameters consist of humidity and temperature. Solution parameters are solution concentration and surface tension. Processing conditions are voltage difference, collector distance, collector rpm and flow rate . In this work, processing conditions and solution concentration were investigated. A series of experiments were carried out to investigate the effect of solution concentration, voltage difference and collector distance. All experiments were conducted between 24 and 26 °C and 44 and 50% relative humidity. Selected solution concentration varied from 10 to 15 wt%. Voltage difference varied between 15 and 30 kV. Collector distance varied between 10 and 19 cm. A small jack is implemented into the electrospinning chamber in order to control the collector distance. An aluminum collector plate, which is connected to the negative pole, is placed on top of the jack. Samples are collected on 10 cm × 10 cm aluminum foils that are placed on the aluminum plate. During the experiments, the flow rate varied between 0.1 and 0.5 mL/h. In the literature, it is possible to find various flow rates for the same conditions [27, 28, 29, 30, 31]. Liu et al. stated that flow rate does not hold a significant effect on fiber morphology considering the fact that the jet can accelerate to a velocity higher than velocity of sound in a very short time. Thus, in this work, it is accepted as an initial condition and not inspected . It is very well known that the SEM uses an electron gun to make an electron bombardment on the samples and the interaction due to the bombardment of high-energy electrons reveals specific data/signals. The processor of the device then generates the image of the sample. It is possible to analyze the chemical composition of the sample as well . For polymeric samples, however, the gold coating process is needed; otherwise, high-energy bombardment burns the sample and becomes difficult to observe the morphology. Thus, a gold coating device is used, and samples were gold coated prior to utilization of the SEM. For characterization, JEOL JCM 6000 + desktop scanning electron microscope is used. Samples were prepared by cutting a small piece of aluminum sheets on the collector where the fibers are collected. They were taken from the regions with higher density. Samples were gold coated for 2 min. Higher filament current resulted in images with better quality. 15 kV voltage gave better image quality; even though the samples were coated with gold, 15 kV voltage burnt the samples and caused electron etching in case of focusing a specific spot for more than 2 min, in 30,000 × magnification. Therefore, 10 kV voltage is used. Probe current was selected as standard. Measurements and characterization of nanofibers were conducted using the software in the SEM system; specifically, diameters of the nanofibers were measured and recorded using the precision indicator of the system. Three parameters affecting the bead formation were investigated, these being the solution concentration, voltage difference and collector distance. It is reported that a bead distributed network of a nanofibrous structure is desired for self-healing, drug delivery and tissue engineering applications. Beads filled with drugs and/or self-healing agents act as reservoirs to repair/heal the damaged and/or corroded sites of the structure [9, 25]. However, it should be noted that the occurrence of beads may not be beneficial and considered as a drawback for other purposes such as filtering, sensors, textiles and composite reinforcements. Negative and positive voltages effect both the formation and the dispersion of the nanofibers. Higher negative voltages resulted in a wide dispersion of fibers on the plate, causing longer electrospinning time for the desired density in the characterization. Therefore, the negative voltage was set to − 2 kV. Experiments for the voltage difference are tabulated in Table 1 for 15 wt% solution concentration and 19 cm collector distance. As it is clearly seen from SEM micrographs given in Fig. 2a–d, increasing voltage difference resulted in thinner fibers. For 15 kV, beads are spherical with a frequent distribution. Even though the fiber formation still exists, the diameter difference is quite high between spherical beads and fibers. For 20 kV, beads are still spherical, yet less in quantity. When 25 kV is applied, the spherical beads tend to have an elliptical morphology. In the experiment with 30 kV, bead formation is observed to be smoother, closer to the fiber formation. This result shows that for fewer beads and more continuous fibers, a higher voltage must be applied. This is due to higher charge density at the tip of the Taylor cone. Table 2 shows the results of electrospinning experiments on the fiber morphology for voltage difference effect with 15 wt% solution concentration and 19 cm collector distance. Collector distance from the tip of the needle is another parameter effecting the fiber morphology and bead formation. Closer the distance means stronger the electrical field effecting the solution jet . Therefore, even for relatively lower voltage differences, solution jet is exposed to a strong electrical field. Another kind of the effect is that the solvent has less time to evaporate in case of short distances. Hence, for very close distances such as 5 cm, there is no fiber formation on the collector because the jet never solidifies. On the other hand, very long distances cause the electrical field to be weaker since the poles are far away from each other; thus, thicker fiber morphology is expected . In the experiment, a laboratory jack is used to adjust the collector distance to the desired value, as it is stated in Sect. 2.1.1.1. Very short distances may cause electrical arcs between needle and collector; accordingly, distances below 10 cm were not considered in this work. The voltage difference is selected to be 30 kV to create the thinnest fibers possible. Table 3 shows the experiments for different collector distances with a constant voltage difference of 30 kV and solution concentration of 15 wt%. SEM micrographs given in Fig. 3a–c illustrate that the 10 cm distance resulted in thicker fibers with an average diameter of 229 nm. Although there are thinner fibers as well in the sample, other collector distances did not perform thicker fibers as the trial with 10 cm did. Thicker fibers occurred since the jet did not have enough time to solidify. However, beads did not occur. 15 cm distance performed thinner fibers without beads. This morphology is a desired morphology in general (see Table 4; Fig. 3a–c). Therefore, one can conclude that 15 cm distance is the most appropriate distance because in the 19 cm distance, even though the fibers are the thinner, large size bead formation occurred. Solution concentration is strongly associated with the viscosity of the solution because it increases the viscosity. Therefore, it holds a crucial role when it comes to the formation of the solution jet at the tip of the Taylor cone. It is expected that the solution with higher concentration will form a thicker jet because drag forces exerted by the electrical area to the fluid cannot overcome the intermolecular bonding between fluid molecules. Table 5 shows the electrospinning experiments for solution concentration effect with the voltage difference, 30 kV and the collector distance of 15 cm. In Fig. 4a, there are many beads in the sample, even though the fibers have 88 nm of diameter on average. The beads are formed due to low surface tension and lower concentration. The force exerted on the solution jet due to high voltage difference can overcome the intermolecular bonds in the fluid if the viscosity is low. As shown in Fig. 4b, 12 wt% the solution resulted in a fewer number of beads. Consequently, in Fig. 4c, the continuous fibers demonstrated no beads. Measurements were taken on the continuous fibers which were not observed in other samples. Such a distinct effect of no beads and microspheres is also reported in a study with 15 wt% DCM (dichloromethane)/CE (2-chloroethanol) concentration. It was attributed to the surface tension which minimizes the surface area . Obviously, an increase in the surface tension is owed to an increase in the solution concentration and it results in very few or no bead formation. Table 6 shows the results of the dependence of fiber morphology and bead formation on the solution concentration. This study investigated the formation of beads and nanofibers to gain a better understanding of the electrospinning process. Electrospinning parameters studied were voltage difference, collector distance and solution concentration. Results showed that these parameters have significant effects on the size and the number of beads, fiber morphology and the efficiency of the electrospinning process. It is demonstrated that the fiber diameter decreases as the voltage increases. This might be due to the possibility that stronger electrical forces and denser charge on the tip of the Taylor cone may decrease the diameter of the jet. Experiments for various collector distances revealed that fibers tend to form thinner and non-beaded morphology in a specific collector distance. (15 cm distance performed thinner fibers without beads.) Fiber diameter continues to decrease with the increasing distance, and bead formation starts to occur. The reason behind this might be the instability in the Taylor cone. Shorter distances than 15 cm result in thicker and non-beaded fibers. This can be ascribable to jet’s lack of solidification in short distances. Thus, the jet gets flatten after it hits the plate. Moreover, very short distances such as 5 cm may even cause the solvents not to vaporize; hence, the fiber formation may not occur. About the solution concentration, it is found that increasing the concentration of polymer solution prevents bead formation and results in continuous and thicker nanofiber morphology. The reason behind this can be the fact that intermolecular bonds are stronger in case of a higher viscosity which is caused by the increase in solution concentration. In case of desiring to produce fibers with beads for specific purposes, one should try to increase the collector distance . If straightly formed nanofiber formation is aimed as in the case for tissue scaffolds of Venugopal et al. work, thicker solution concentration and closer collector distances with lower voltage should be utilized during the processing. The micro-/nanofiber diameter can be controlled using these parameters. The authors would like to thank the Istanbul Development Agency for their support through the funding of the Project Nos. İSTKA TR10/15/YNK/056 and TR10/16/YNY/0016.